Homemade Tamales are the real deal. They take some time, but that’s part of what makes them so magical. Families have gathered for many, many years, often just before the holiday season, and each person would have their own job – working together, laughing, reminiscing, and creating delicious treats for everyone to enjoy whenever anyone wants one during the holiday season. 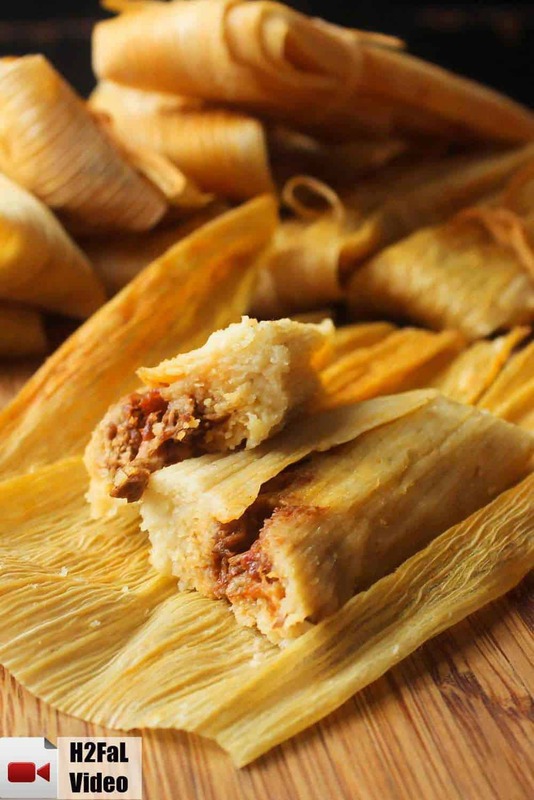 Making authentic homemade tamales from scratch is easier than you might think! Watch us show you how to make the best tamales in town! Soaking the corn husks for a couple hours is important to make them nice and pliable for when you are ready to fill them. I do this by taking a large roasting pan, placing the husks in the pan, and then filling the pan with water. I then place something heavy (my Dutch oven lid works perfectly) on top of the husks, and then just let rests for at least 2 hours. Once you are ready to use, pat them off with a kitchen towel, and you’re good to go!. The pork filling is so incredible, the peppers give them just a little heat, but not too much. And there is something about the chicken filling that is just so satisfying. Let the chicken filling simmer until it has thickened somewhat. 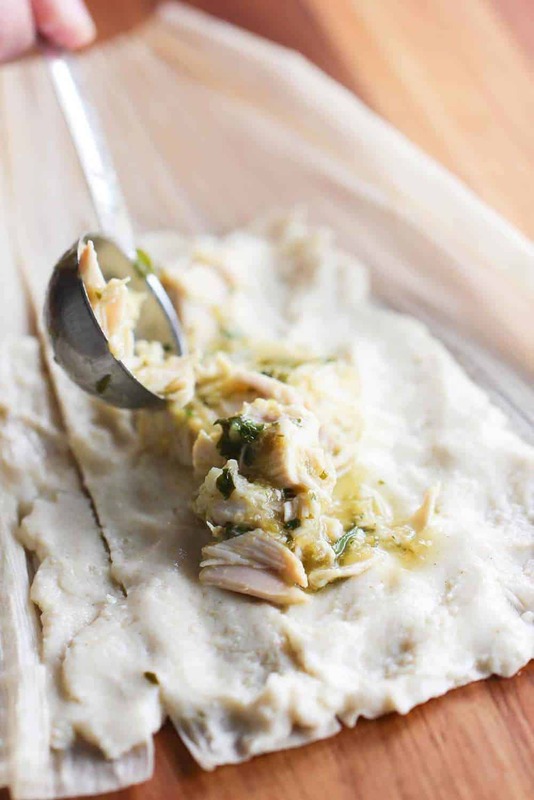 Both fillings are amazing in these homemade tamales. Sometimes this may take a little longer than expected, but just be patient, it’s all so very worth it! Fresh ingredients are always the best!! When making the dough, I like to use my hands. Keep adding stock until you’ve got the consistency of cake batter. It shouldn’t be runny. You can see here, we’re real close, just a little more chicken stock, and then we’ll be set. 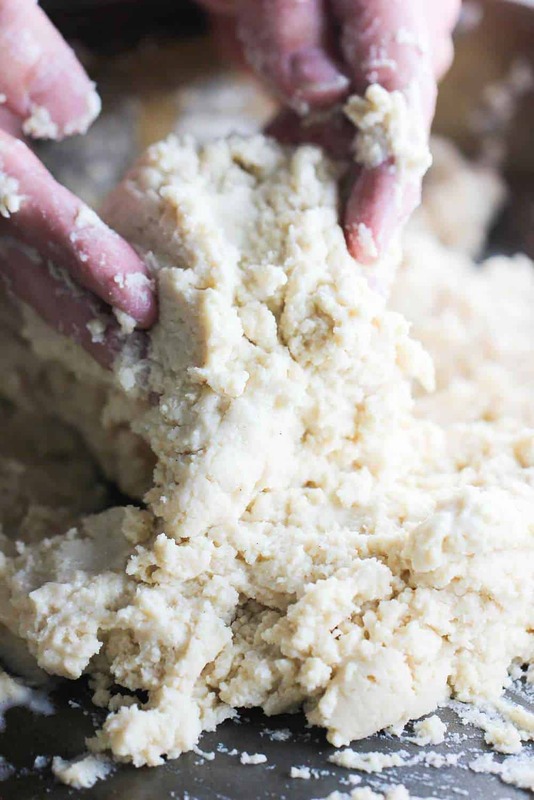 Once you are ready to spread the masa dough onto the husk, you won’t need too much. Just a thin layer works perfectly. This is because the dough will expand in size as it is being steamed. And did I mention how delicious using rendered pork lard is in the dough? I didn’t? Well, it really, really is. And…it’s better for you than shortening. Seriously! Fold once side in towards the middle, and then fold in the other side. It takes just a little bit of practice, you’ll get the hang of it very quickly. 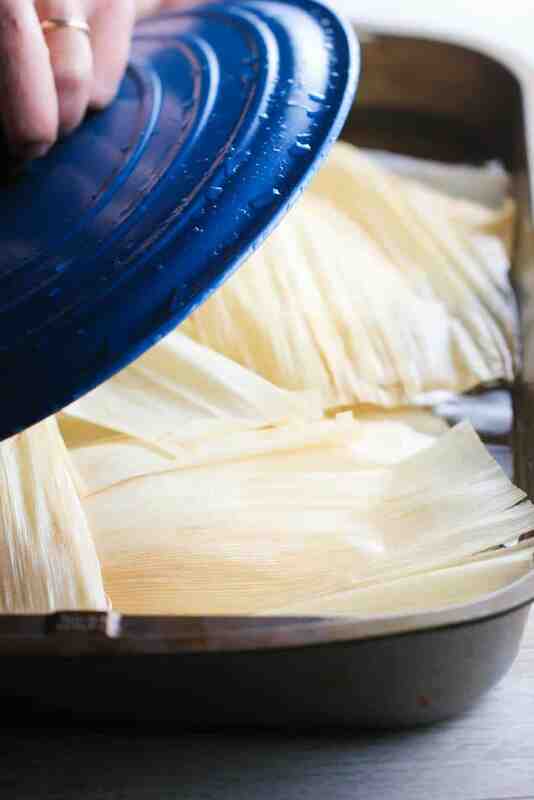 It’s almost steam time, which means we’re getting close to HOMEMADE TAMALES TIME!! Authentic Homemade Tamales are something magical. This is a recipe for both chicken and pork tamales. They are the real deal. About as good as you'll find. So heart-warming and steeped in history and cherished by families generation after generation. We absolutely love them. They freeze very well, too. Place the husks in a large bowl, or even your kitchen sink with the stopper in. Fill with warm water and weight the husks down with heavy pot(s). Let soak for at least 2 hours. Place the tomatillos and jalapenos in a medium sauce pan and cover with water. Bring to a boil then lower to a smooth simmer. Simmer the veggies for 20 minutes. Add the cooked veggies, plus the garlic in your blender, and process to a smooth puree. Heat the oil in a large skillet, or Dutch over medium high heat. Once oil is hot, add the puree all at once and stir until thicker, and a little darker, about 10 minutes. Add 2 cups of the stock and simmer over medium heat until thick enough to coat a spoon, about another 15 minutes. Season generously with salt, about 2 teaspoons. 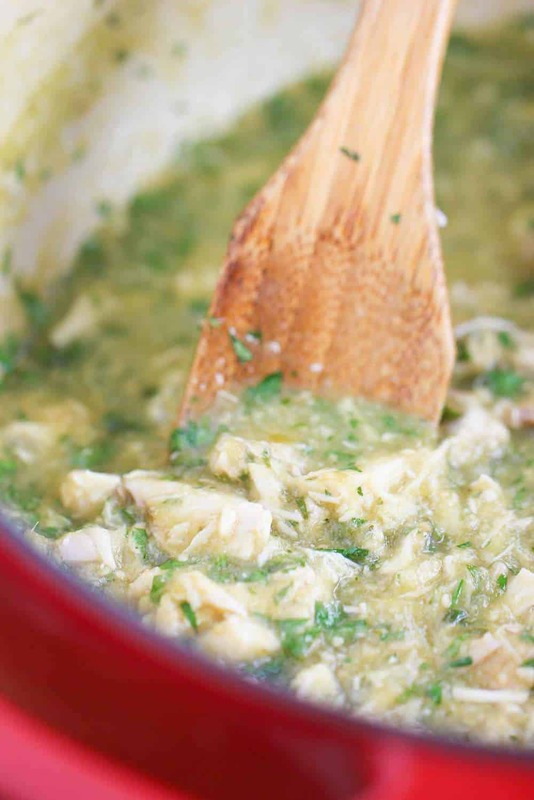 Stir in the chicken and cilantro, remove heat. Add the peppers and the tomatillos to a medium sauce pan, cover with water and bring to a boil. Lower the heat to a smooth simmer for 20 minutes. Working in batches, if necessary, add the peppers, tomatillos, garlic, black pepper, cumin into a blender and puree. Strain the mixture a through a medium-mesh strainer into a medium saucepan. Add the meat, 3 cups of water, and 1 teaspoon of salt. Simmer, uncovered, over medium heat, stirring regularly, until the pork is fork tender and the liquid is reduced to the consistency of a thick sauce, about an hour and a half. Use a fork to break the pork into small pieces. Taste and season with additional salt, if necessary (taste first). Get a large pan (I like to use a roasting pan), and add the wet masa (make sure you've already added the hot water to the masa) salt, and baking powder, and mix with your hands. Pour in the melted lard, and continue to incorporate with your hands. Now, add in the broth, one cup at a time. Keep mixing with your hands. The consistency should be like a cake batter...but not runny. It should hold it's shape in a spoon. Now, take a corn husk, and pat if off with a dish towel. Flatten the husk, and with a spoon, scoop out about 1/4 cup of the batter. In the upper, wider portion of the husk, spread the batter to the size of about a post card. With the short side of the rectangle at the top of the husk, and the body of the rectangle running down the length of the husk. Leave about an Inch of space on each long side of the husk (watch the video for reference). Don't worry about making the batter thick...it will expand as it steams. Now, scoop out about two tablespoons of the chicken mixture and spread it down the middle of the batter. Fold over the right third of the husk, then fold in the left side. Repeat, alternating between chicken and pork filling. When making the pork tamale, tie with a string. Place uncooked tamales on a large baking sheet. Place unused corn husks on each layer of your steamer. 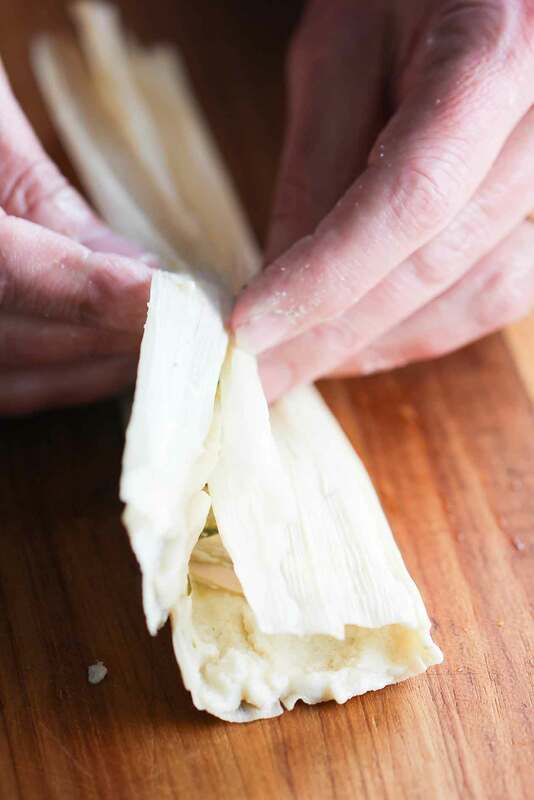 Place corn husks over the top of the tamales. Add water to the steamer and cover. Heat and steam over a constant medium heat for about 1 and 1/4 hours. Watch carefully to make sure that all the water doesn't boil away, add more water as necessary. Tamales are done when the husks peel away from the masa easily. The tamales will need to stand for at least a half an hour for the dough to firm up. For the best tamales, let them cool completely, then steam again to warm (you can easily heat in a microwave at this point). You guys are awesome!! So happy I came across your webpage this look absolutely delish!!! 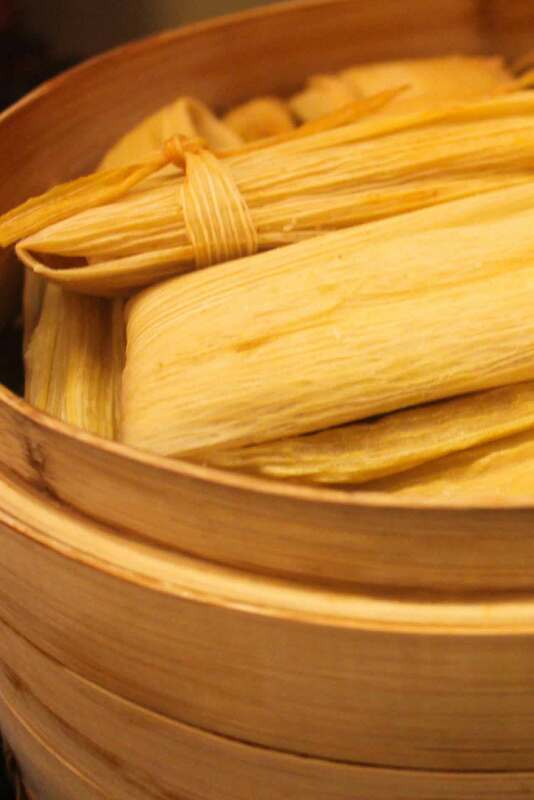 Your picture shows tamales being steamed on their sides. I always thought you had to stand them up. I never made them because I don’t have a pan tall enough to stand them up. Does it work well to steam them on their sides? Hi Jane!! So sorry for the delayed response. You can lay them on their side and they’ll steam beautifully. Just try avoiding stacking them on top of each other. I use my double-stack bamboo steamer, and it works perfectly!! Wife makes about 70 dozen per week by hand. It’s better to use fresh ground masa instead of Maseca – the flavor is so much better. Also, if you actually cook the masa, adding the broth from the pork into it while staring constantly, you get a moister, more flavorful tamale. By the way, she also makes a bunch of sweet ones, like pineapple, strawberry, chocolate, etc., plus the veggie ones she calls “Rajas”. The sweet ones take rice flour and use Maseca, plus the sugar in the masa, pureed fruit etc. She will generally use jam for the filling, i.e., strawberry preserves for strawberry, etc. How spicy do these turn out? I can tolerate mild but not much else. Do I need to cut back on the jalapeños? Can you use already wet masa bought in torterilla? Do I leave out the hot water? Hi Angie! Yes, you can use purchased wet masa, that will work great. I do not believe you would need to add the hot water, but you might double check with the folks you buy it from…I bet they’ll know! Let us know how it turns out! What can I use instead of the lard? Hi Nicole, you can substitute shortening (Crisco) for lard, but it won’t have the same authentic taste, but will still be delicious. I made this recipe for my husband and my stepson because they are from Mexico, i wanted to know how to make it. They are definitely delicious with pork, chicken was good just slightly dry. I also had made some with mole and chicken it was amazing. I love tamales & my sister in law made some 1 year for Christmas & needless to say, I was in heaven! She used beef roast to make them & the sauce I can’t remember the name but they were amazing! Thank you for sharing & I will definitely be making these soon! I tell you, I don’t think I ever met a tamale I didn’t like! 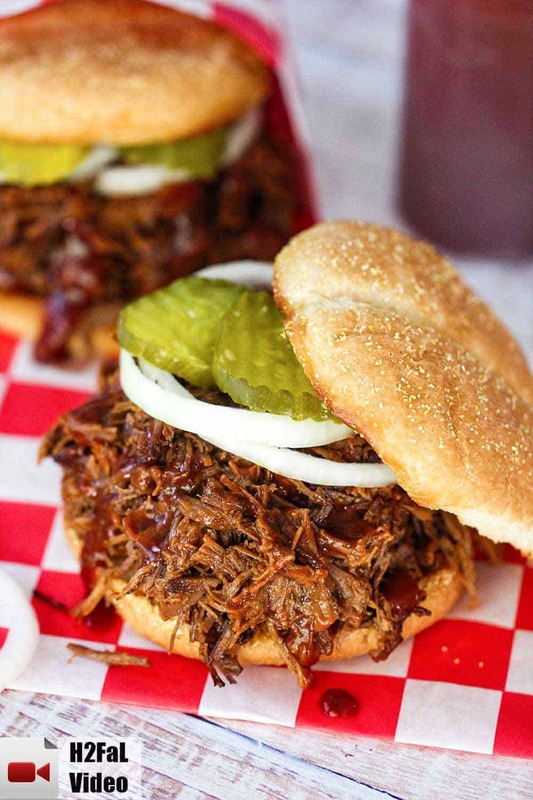 Roast beef sounds pretty darn good! We just love making these. The recipe makes quite a few, so they are great for sharing with loved ones, too. They always get rave reviews! Let us know how they turn out! All the best, Kris & Wesley. Can the lard be substituted with some else? These tamales were Bueno Bueno Bueno! Better than any I have ever tried and gluten free too!